Nikon's old consumer strategy was to re-use sensors in as many bodies as possible, to bring down overall sensor cost. Unlike almost everyone else in the business, Nikon has a more diversified sensor approach than any other company. This appears to be the very first larger sensor (>compact camera) Toshiba has offered. The test results on this sensor are very good, pretty much equivalent to state of the art except for perhaps one minor caveat. It's difficult to understand what Nikon is doing here. There doesn't seem to be an apparent reason to make a sensor differentiation between the D3200 and D5200: the D5200 differs enough from the D3200 in a number of other features that it doesn't need a possible sensor difference. There's obviously an untold story going on behind the scenes, as combining the D3200 and D5200 volumes with the same sensor should produce economies of scale, but Nikon has chosen not to go that route. Instead, they've chosen to use the same sensor in the D7100. Thus, the most produced body (D3200) gets one sensor, the second two most produced bodies (D5200 and D7100) get another. We'll get back to the sensor in a bit, but we have other things to talk about with the D5200. 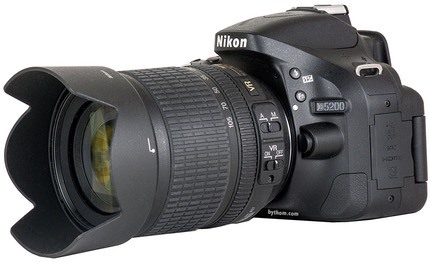 For example, the D5200 was a staggered release, another unusual thing in Nikon's DSLR history. Instead of announcing and shipping the D5200 worldwide, Nikon withheld the North American release by a couple of months. Whether this was because NikonUSA wanted to clear more of the D5100 inventory or whether Nikon was trying to allocate a lower-than-usual initial build of product isn't known. Still, it's just one of the anomalies in the D5200 that seem to indicate that Nikon is making decisions differently in the consumer DSLRs than before. The D5200 was introduced outside the US and Canada on November 6th, 2012 and shipped late that month. In North America, the camera was announced at CES in early January and shipped in February 2013. 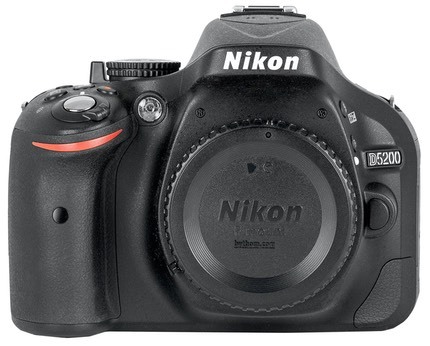 The D5200 is the third in the series of intermediate consumer DSLRs from Nikon, with the D5000, and D5100 preceding it. The key defining element of the D5xxx series has been the swivel LCD, and that remains with the D5200. One backwards step is that the buffer isn't quite as robust, dropping from 10 frames NEF to 8 (Fine JPEG drops from 100 to 35). The 3" positionable LCD remains 921k dots, and except for some minor menu additions, pretty much everything from the D5100 moves on intact, including the viewfinder stats and battery. 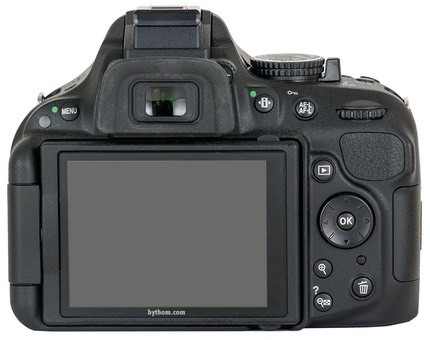 The D5200 uses SD cards and has a side door slot. Options for the camera include wireless remote, WiFi capability (WU-1a), and GPS (GP-1). Overall, the D5200 has pretty much everything you'd expect from a mid-range DSLR, including built-in sensor cleaning, LiveView, Quiet Mode, intervalometer, and more. If you're interested in the full list of specifications, check out my data page for the D5200. The one thing every D5200 purchaser needs to remember, though, is that it has no support for lenses without focus motors. That means that autofocus only works with AF-S (Nikon), HSM (Sigma), or Tamron and Tokina lenses that specifically say they have a built-in focus motor. Older AI and AI-S lenses (manual focus era) won't meter on the D5200, though you can mount pre-AI lenses on the camera without damaging it. For the most part: just like a D5100. Users of traditional Nikon DSLRs will feel mostly at home, though there is a lack of buttons overall, only a Rear Command dial, and all the buttons on the back of the camera except one are arrayed to the right. Having used a lot of mirrorless cameras lately (for the sansmirror.com site), I've gotten used to a lot of touch screens. Frankly, the D5200 needs one. Indeed, the whole Shooting Information display notion works better with cameras that have touch screens than ones where you have to continually tap on buttons or the Direction pad to make a choice. The Nikon sequence is Info, Info, Direction pad to item, OK button, Direction pad to choice, OK button. That often leads to sequences of eight, nine, ten presses to set something. Contrast that to a touch screen: touch for info, touch item to change, touch choice. Three presses for pretty much anything. While there's nothing particularly bad about the Nikon shortcut system (you can also set most things through the menu system, but that might be many more presses for some items buried deeply in the long menus). However, it's already starting to feel antiquated. For the class of users typically considering the D5200, touch screens are something they're highly familiar with now. Most users of a camera of this level will miss having no buttons that control ISO, white balance, metering, or AF mode. You can program the Fn button to perform ISO or white balance, but that's likely to be one button short of what most user want. If you're always setting the same thing (e.g. white balance), leaving the Shooting Information display highlight on that means Info, Info, OK, navigate to selection, OK. That's not a good enough shortcut, in my opinion. Maybe it was when the system was designed, but competitors with less expensive mirrorless cameras have done a better job with their touch systems, so I can't give Nikon's system a straight pass anymore. That's a problem in high tech. What got you an A a couple of years ago merits only a C today. It does not feel like Nikon is moving forward fast enough. Don't get me wrong, I fully appreciate the historical legacy of allowing a trained Nikon user to continue to do the same thing on a new camera, and I'm not asking Nikon to abandon that. Nikon doesn't need to take that off the current models; they instead need to add newer and slicker ways of getting to the same result faster, as their competitors are certainly doing. Given how many things we have to control on a sophisticated camera such as the D5200, we want faster access, not just the same old slow access. I've mentioned the Shooting Information display several times already: it's been refined and is a little clearer, though still has that gimmicky look for many simple things (like aperture and shutter speed). Unfortunately, there's no eye sensor in the D5200, so we're back to the old on/off with the half press of the shutter release again, which can be highly distracting. You can, however, just turn the LCD around so that it isn't visible to remove that distraction, but then you don't have quick access to things via the Shooting Information display! Taketh, giveth; a nearly constant in Nikon's incessant tweaking of designs that weren't broken. Live View is invoked by a lever underneath the Mode dial, not the new control we've seen on the D600, D800, and D4. The Mode dial itself has the usual lower end emphasis on Scenes and Effects, and does not have custom positions on it like the D7000 does (i.e. no U1 and U2 position). Nikon's figured out the IR remote control thing: we get both front and back receivers. If that's not enough, a new wireless remote system was launched with the D5200 (I'll write about the WR-R10/WR-T10 separately when I've had more experience with them). The "drive" control that sets single frame, continuous, self timer, and remote has reappeared, too, and is in a nice handy position up top of the camera. One big issue for some is going to be the buffer: it isn't big enough. Shooting raw (14-bit compressed NEF) you'll hit the buffer limit in about a second, possibly less if you've got some advanced features turned on. JPEG shooters, of course, don't have that problem, and it seems that Nikon is now really targeting JPEG shooters with their consumer DSLRs. All that said, the D5200 handles like a Nikon DSLR for the most part. A Nikon user will find their way around fast enough, though we have the usual menu dance where options seem to move for no great reason. Battery — I'm not a fan of the EN-EL14. It's barely above half the capacity of the EN-EL15 used in the higher specified cameras. With the swivel LCD there's more temptation to use Live View on the D5200 than the D3200, too (it shares the battery with that camera). The fact that you use either the Shooting Information display or the menus via the LCD to set most things like WB and ISO means you're dipping into the power-hungry LCD more often, too. It seems clear that Nikon picked the battery because they felt that the D5200 user was a "casual" user and not one to be taking hundreds of photos a day. That shows in the performance of the battery. The CIPA number is 500 shots. I find that I'm a little under that mark in my general shooting with the camera. Not a terrible thing to be able to take 450 shots or so per charge, but still, it means that if I'm truly out shooting all day I need to carry two batteries. Video users, well, carry plenty of batteries. The run-down timings I'm getting are in the 90 minute range. Writing to Card — This turns out to be something you want to pay attention to. The basic buffer is 14 shots in JPEG Fine Large, 6 in NEF. If you don't have a UHS-I capable SD card, you're going to be waiting for the buffer to clear on almost any continuous shoot. You can get out of the JPEG jam by just dropping to JPEG Normal Large, but again, this points to the target customer Nikon was designing for, and again brings up the "why do we need 24mp if we're compromising image quality via compression" question. Older, slower cards definitely put more limitations on the buffer when you fill it—I've got one three year old card that took three times the time to clear the buffer a state-of-the-art one. Autofocus — No real complaints here. If you're coming from one of the 3 or 11-sensor Nikon DSLRs, the 39-point system will seem luxurious, competent, and complex. With AF-S lenses other than the kit lenses (which use a lesser motor), focus performance can be quite snappy, even on moving subjects. Tracking is a little less capable than the high-end cameras with faster CPUs, more AF sensors, and more metering information, but the D5200 is definitely the best of the affordable DSLRs in terms of AF performance that Nikon has made. Basically, Nikon has brought their previous high-end consumer DX AF performance down to the mid-range camera. If there's any drawback to the system its that it can't be AF Fine Tuned. You're stuck with how well the factory in Thailand got the calibration dialed in and how well your lenses are up to spec. I've got one lens that needs +10 AF Fine Tune on most of my bodies, and that means it just doesn't have a lot of acuity on the D5200 if I don't manually tweak focus. On the other hand, my big 400mm f/2.8 has never need AF Fine Tune on any camera, and it snaps in just nicely on my D5200. Video autofocus is still the same old slow hunt. It's reasonable for static or nearly static subjects, but if the subject is moving much, or if you're moving the camera, it's not reliable. Virtually every camcorder out-focuses the Nikon video modes on DSLRs these days, and the D5200 is no exception. Metering — Same old tricks: too much reliance upon the tonality underneath the current AF sensor, which makes the exposures seem a little inconsistent on the D5200 taken in the same light. Get focus on something dark and the exposure will be a little hot; get focus on something bright and the exposure will be a little dark. Easily enough compensating for and dealt with, but still, I just don't understand this bias Nikon has put into the system; it tends to make the matrix portion of the metering system—which is as good as there is—underperform more than it should. Image Quality — The good news is that, with one exception, the Toshiba sensor is performing pretty much like the state-of-the-art Sony Exmor sensors (used in the D600 and D800, for instance). High efficiency, good dynamic range, familiar Nikon Picture Control colors, and more. For more on this, see my D7100 review, as that camera shares the same sensor. The exception is a big one: data living down five stops or more from middle gray (e.g. deep shadows) can have pattern noise to it, something many call "banding." For almost any normal exposure and post processing, this isn't an issue. But if you ever have to do large amounts of deep shadow recovery or if you use Active D-Lighting Auto on high contrast scenes, watch out, as the banding can be brought up into the visible range. Unlike film grain or high ISO noise, pattern noise looks artificial, almost as if you were shooting through a fine mesh screen. Note that the pattern noise is only in those very low tonal values, so most of your image will look fine, but the low shadows you brought up will have the pattern in them. Yes, this is one of my classic basketball shots. 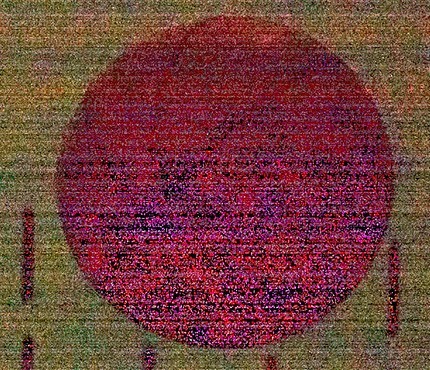 As shot, the JPEG looks black. Heck, even raising the "exposure" in Adobe Raw Converter as much as possible, we still see mostly black. But by pushing Levels to see what's happening down in that black area, we get the above shot, and you can clearly see the horizontal banding that occurs deep down in the shadows. Note that this is an example well beyond what you'll ever do in real life. There's really no usable detail down this far below middle gray, so I'd never be trying to bring anything back this much unless I managed to get a photo of Bigfoot but botched the exposure by nine stops. A lot has been written on the Internet about this problem, mostly hyperbole and exaggeration. Nevertheless, the problem is indeed there, and it may some day impact an image you take. Slightly. Fortunately, I've been able to remove any pattern noise pretty easily when it does show up in normal exposures where the shadow details have been brought up. Topaz DeNoise 5 has a Debanding control that, tuned correctly, does a pretty good job of removing the visual problem. You'll get a bit of aliasing blur on fine details when you do that, but still, you can make it a non-issue pretty easily. Video — Surprisingly good video from a low-end consumer DSLR. Other than too much rolling shutter, video output from the D5200 looks remarkably good at the high bit-rate settings. Should You Get a D5200? Let me turn that around: who would a D5200 be a step forward for? Easy: D40, D40x, D50, D60, D70/D70s, D80, D3000, D3100, and D5000 users are obvious choices. It's really a no-brainer for those folks, as the D5200 is a pretty marked step forward for all of them. It's a little tougher for the D5100 users, but I'd still tend to say that it's an upgrade worth considering if you really have a use for 24mp. For D3200 users, you'd be switching 24mp horses, basically picking up more features and a better AF system along with that swivel LCD. If you're looking at Canon, Nikon, and Sony low-to-midrange DSLRs, the D5200 certainly makes for a compelling product. The sensor delivers about as well as the Sony sensors (and better than the Canon), the focus system is decent, and the video features aren't bad, either. There are a lot of good cameras in the D5200's class and price point, so make sure you're buying one for the right reasons. Generally, I think handling should be elevated above performance at this level, as if you're not comfortable with the controls and the way the camera is managed, you'll miss pictures and it doesn't matter how many megapixels it has or how good they are. In essence, the D5200 is a solid performer with a lot of useful features. What you have to be careful of is evaluating it too highly on the pixel count. For instance, between a 16mp D7000 and 24mp D5200, which is the camera that will give you better image quality? Well, what about AF Fine Tune? The D7000 has it and the D5200 doesn't. Slight misses on focus because of an out-of-tolerance lens or body could prove to be more problematic than fewer pixels. DX Lens Choice. Nikon hasn't made a lot of DX lenses that will really still shine with 24mp at the back wall. With telephoto you can always dip into Nikon's large stable of FX telephoto lenses, but at the wide end, make sure the lens exists you need. Buffer Wall. Those 24 million pixels weren't given more room to play in; you'll fill the buffer fast, and you'll need a fast card to clear it quickly. Banding. Really deep shadows have patterns to them. Toshiba Delivered. To the surprise of many, the Toshiba sensor is quite good. Good enough to stand up against the best in almost every respect (deep shadow recovery notwithstanding). Right Price. The intersection of performance, features, and price is just about right.